Leicester striker Jamie Vardy should not have been sent off for diving during his side's 2-2 draw with West Ham, says England boss Roy Hodgson. 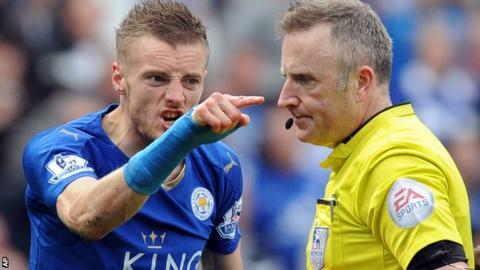 Vardy was shown a second yellow card on Sunday when referee Jon Moss ruled he had dived in the Hammers box. The 29-year-old, capped six times by Hodgson, has a one-match ban that could be extended following an improper conduct charge for his reaction. "I will go out on a limb. I don't see that as a dive," said Hodgson. "I think he was unbalanced. I don't think it was a penalty either. I think he was unbalanced, running at that speed. "I think there was a very slight contact with the defender [West Ham's Angelo Ogbonna], who was trying to cover. "But of course all the pundits I hear say he was trying to dive, look how he dived. I don't see it. I wouldn't blame him for that. I sympathise with him. I think he was very, very unlucky." Vardy, who has scored 22 goals for the league leaders this campaign, angrily berated Moss following the decision to send him off, but Hodgson felt the striker's reaction was understandable. "He has reacted like human beings sometimes react," added Hodgson. "He hasn't just said to the ref, 'that is all right, I understand' and shake hands and have a good game. He has called him a few names. But he is a human being and that can happen." Vardy will now miss Leicester's Premier League game at Swansea as the Foxes look to move another step closer to their first Premier League title. But City defender Christian Fuchs insists Leicester can cope without their top-scorer. "It's a new situation for us because Jamie hasn't missed a game yet but I think we can cope," Fuchs told BBC World Service Sport. "We have this confidence, we have the quality. Every time Leonardo Ulloa comes off the bench he has done well and he's a big part of the team. I think we can definitely compete." Jamie Vardy: How long should Leicester star be banned for? Striker Ulloa came on against the Hammers after Vardy, who has scored 22 league goals this season, was shown a second yellow card for diving early in the second half. The Argentine scored his fourth goal of the season from the penalty spot in the added time to earn City a point. He is likely to deputise for Vardy in Leicester's next game, at home against Swansea on Sunday, alongside Shinji Okazaki, who has scored six goals so far this campaign. Tottenham reduced City's lead at the top of the table to five points with an impressive 4-0 win at Stoke on Monday. "They played a really good game against Stoke but it's not putting any pressure on us," said 30-year-old Austria defender Fuchs. "We don't really feel the pressure. "Nobody expected us to be five points clear with four games to go. So where is the pressure for us? We have nothing to lose. "Nobody expected Leicester to be up there. It's very enjoyable for us. We're in a great position. It's our performance that we have to focus on." On Vardy: "We know for sure that we're going to miss him this weekend at home to Swansea, but we have other players that can step in - Ulloa has done very, very well this season whenever given the opportunity. He could reshuffle a little bit, maybe Riyad Mahrez in behind Okazaki up front? But we're more than capable of dealing with Jamie's absence." On the title race: "Spurs have an opportunity now where they haven't been ever before in the history of the Premier League so they are going to go for it, they have to go for it. We were disappointed at the weekend but we took a lot from the game as well." On qualifying for the Champions League group stages: "It's a remarkable achievement for a club like Leicester, who were one of the bookies' favourites for relegation this season. It's just been a remarkable season and hopefully it continues." Fuchs also praised the work done by manager Claudio Ranieri, who took over from Nigel Pearson in the summer and has led the Foxes to 21 wins from their 34 Premier League matches this season. "He's making us focus on ourselves and the next game," added Fuchs. "He's telling us every time 'guys, what we can effect is our performance, our game' and he's very right with that. "Tottenham can win every game now but we also have the chance to do that and that's what we have to focus on."